Mandatory water restrictions in KwaZulu-Natal’s largest system, the Mgeni System, were officially lifted on Friday, 31st August 2018, following improvement in the levels of the five dams and a weir in this system. The decision to remove restrictions of 15% for industry, business and residential, and 50% for irrigation (agriculture) was taken by the Acting Director-General of the Department of Water and Sanitation, Deborah Mochotlhi, in terms of Sections 63 and 72 of the National Water Act and published in the Government Gazette of Friday, 31st August 2018. This followed a recommendation by the Mgeni System Joint Operations Committee, established to monitor and manage bulk potable water distribution and supply to consumers, that restrictions in the Mgeni System, including the Mooi River and Little Mooi River, be withdrawn due to an end to water shortages. The Mgeni System supplies drinking water in bulk to the municipalities of eThekwini, uMgungundlovu and Msunduzi, and an estimated four (4) million consumers ultimately receive water that is treated in and supplied from water works in this system. Publication of Notice 911 in the Government Gazette of Friday, 31st August 2018, means water restrictions in about 80% of the eThekwini region, all of uMgungundlovu and all of Msunduzi, including Pietermaritzburg, have officially come to an end with immediate effect. The restrictions were implemented two (2) years ago at the height of protracted water shortages in Mearns Weir and Spring Grove, Midmar, Albert Falls, Nagle and Inanda dams. It was adopted as a strategy to prevent Midmar and Albert Falls dams reaching dead storage (when there are acute shortages and poor quality water to treat). On Friday, 31st August 2018, the level of Mearns Weir was at 66%; Spring Grove Dam at 85%; Midmar 95%; Albert Falls 49% (pictured below); Nagle 72%, and Inanda 68%. Current storage in these dams and weir is an improvement from a year ago, on 1st September 2017, when they ranged from 27% to 70%. Albert Falls – the largest dam in the Mgeni System – still remains of concern to Umgeni Water due to its level remaining at consistently below 60%. 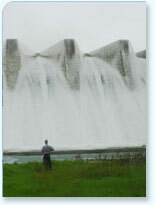 This dam provides the water needs of a significant part of Durban. Levels of dams in the Mgeni System began improving in the first quarter of 2018 following good rains in its catchments. A hydrological analysis done by Umgeni Water and the Department of Water and Sanitation in May 2018 showed that the system had recovered sufficiently to warrant removal of constraints placed on Umgeni Water’s potable water production at its water treatment works. This was also sufficient reason for a motivation to be made for the Ministry of Water and Sanitation to issue notice in the Government Gazette lifting restrictions of 15% for business, industry and residential, and 50% for irrigation. Total storage in the entire system remains at 70%, also a level of adequacy for restrictions to be removed. Removal of restrictions is an excellent development that has the potential to reignite business confidence and unlock projects that had been deferred because of water shortages. The spin-offs are many, for example, new housing and industrial development could occur and new jobs created. At the same time, while it is good to rejoice in water adequacy, vulnerability of the Mgeni System must not be forgotten. This system is still constrained, meaning there is a shortfall in which demand exceeds yield and the possibility of further augmentation, after upgrade of production capacity of Midmar Waterworks, does not exist. Two crucial factors will push the system back to where it had been a year ago: prolonged period of below-average rainfall and irresponsible use of water. It is, therefore important that consumers continue to use water sparingly and implement other water savings measures, such as fixing of leaks and use of water-efficient household appliances. In the Government Gazette of 31st August 2018, the Acting Director-General also announced removal of water restrictions in the Klipfontein Dam and White Mfolozi River to Ulundi Weir system, and in the Hluhluwe Dam river system.